Trump’s inaugural address was terrifying. 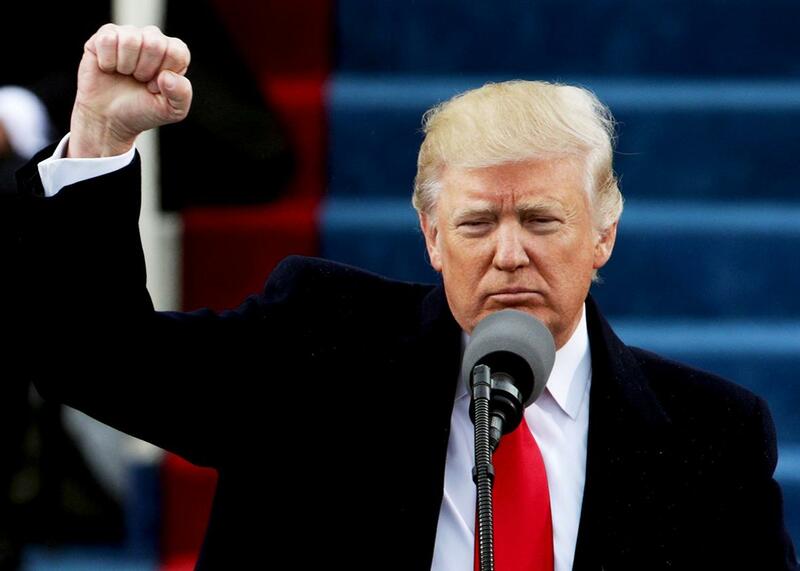 President Donald Trump raises a fist after his inauguration on Friday. In 1780, John Adams famously wrote of the need for “a government of laws and not of men.” Today, Donald Trump has ushered in a government of men and not of laws. The law is immaterial to Trump, as he demonstrated so often during his campaign. In his view, the law exists almost exclusively to punish political opponents (“lock her up”) and to defang critics (“we’re going to open up the libel laws”). It exists to strip citizenship from protesters, to punish immigrants, and to bless extra-constitutional actions ranging from torture to religious registries. Judges are either on his side or they are illegitimate. Trump seems virtually unaware that presidential powers have constitutional limits or that judges strive to apply neutral law regardless of the named parties. He seems uninterested in the fact that governmental checks and balances make us all more free. He is unburdened by the knowledge that protest, assembly, and a free press are the cornerstones of liberty. So nobody should be surprised that not a word about the courts, the law, or the Constitution were uttered today, or that law to him means “law enforcement officers” and nothing more. We should be terrified, though. This was a speech that seemed to conflate freedom with patriotism: The most soaring sentence of the oration posited that the “bedrock of our politics will be a total allegiance to the United States of America, and through our loyalty to our country, we will rediscover our loyalty to each other.” That is not a statement about the rule of law, nor is it a tenet of constitutional democracy. It is a pledge of fealty, in which the law—real justice—finds no place. This is the stuff of King George. It’s the speech of a man who believes there should be no refuge in the law if we fail the tests of patriotism and loyalty. It was a speech with no mention or awareness of the fact that the president’s power derives from the Constitution to which he swore an oath this morning, or that the people’s freedom derives from the same. This was, as many have observed, the most populist inauguration speech ever delivered by a kleptocrat billionaire American president. It was also the most stirring speech about patriotism unmoored from the law, the Constitution, checks, or balances. The only protections Trump offers are the power of the police, the military, and of God. I fear that the first two, untethered from any reference to the rule of law or the guarantees of freedom, will afford some of us scant liberty. I fear that the third, like “the law” itself, will soon be deployed to benefit some, but not all, of God’s children.